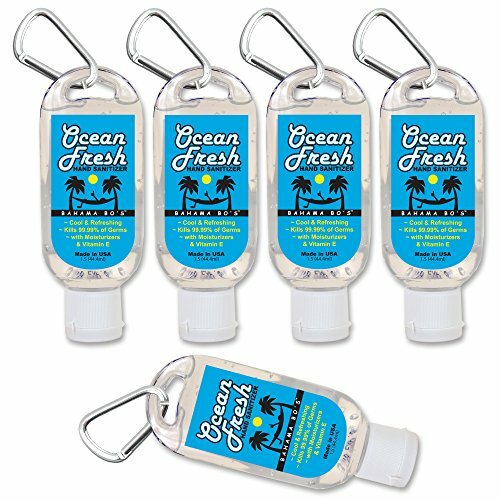 Bahama Bo's 1.5 oz travel size mini antibacterial hand sanitizer with carabiner clip makes it easy to find when you need to sanitize your hands on the go. Kills 99.99% of germs. The moisturizers, including aloe and vitamin E, leave your hands feeling replenished and refreshed. This is a 5-pack so you can put one in several places and find it fast. Keep it on your carry-on bag, backpack, belt loop, on the plane-wherever you want to be able to clean your hands. Pairs well with Bahama Bo's Travel Size Mini Hand Lotion. Mild Ocean Fresh scent. Airline approved container size. If you have any questions about this product by Bahama Bo's, contact us by completing and submitting the form below. If you are looking for a specif part number, please include it with your message. "It's a Boy" Premium Hand Sanitizer 12-Pack, 1.5 oz Pop Top Containers with Carabiner Clips, Kills 99.99% of Germs, Made with Aloe Vera, Vitamin E. Baby Shower Party Favors.